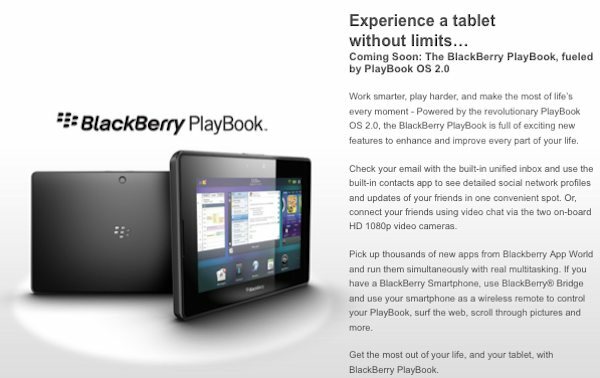 Best Buy Canada got a bit of a jump on things when they listed the PlayBook OS 2.0 software as "coming soon" in their recent ad, and now they may be getting a bit ahead of themselves once again. As listed on their PlayBook product page, Best Buy notes that PlayBook owners will be able to access both Twitter and Kindle apps. Plug in to BlackBerry App World and read, write and game like never before. With thousands of apps for every use, you'll never run out of new and exciting options. Pick up Angry Birds or Cut the Rope, read the latest magazines, or connect online with Facebook and Twitter apps. With access to Kobo and Kindle, you can enjoy new late night reading without ever leaving your living room. We still haven't heard any news regarding either of these apps, but they have topped the most-wanted list for PlayBook apps for quite a while. If you recall, Amazon had announced a Kindle app before the PlayBook ever saw the light of day yet we've heard nothing on it since. So this could be a big "oops" on Best Buy for dropping the ball, or just a crazy mix up that is getting us excited for no reason. In any case, we should find out very soon.